Durable nylon handle; "QuickChange" blade mechanism; one hand opening operation; folds into convenient carrying size; belt clip for easy carrying. 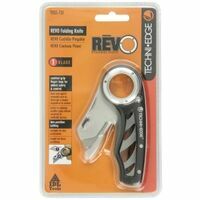 TechniEdge Folding Utility Knife, Series: Revo, Standard, Utility Blade, Comfort Grip Handle Blade safely folds into handle for compact size and easy storage; quick blade change for easy and fast replacement; soft grip ergonomic handle design for increased comfort; accepts all standard type utility knife blades. Retractable blade that offers a variable cut depth. The rapid load blade change has an easy access button for quick blade change. It has a folding feature for quick and easy one-handed opening/closing and blade storage for convenient access to new blades. It has a rugged metal body for long tool life. Powder coated, epoxy handle, safety blade lock, replaceable stainless steel blade. Blade folds into handle for safe storage. Accepts 11-040 (sku # 192.2251) or 11-041 (sku # 192.2269) replacement blades. Lightweight ABS handle with key chain. Blade changing is easy with no tool required. Includes: (1) one blade. Lightweight aluminum handle with key chain folds to 2-1/4". Combines the best features of a lock back knife with a utility knife. Features a sturdy aluminum handle, fold out blade housing. Blade is changed easily using snap lock and sliding mechanism. Uses standard midget utility blades. Includes: (1) one blade. 5 position locking; quick blade release dial; easy press lock button and thumb press; includes 5pc extra blades, belt clip and hang hole in casing tail. 5 position locking; quick blade release dial; easy press lock button and thumb press; includes 5pc extra blades, belt clip and hang hole in casing tail. BladeLock technology keeps blade locked in place and further improves safety by providing the user with the ability to change blades only when the release button is engaged and the blade holder is in the 45 degree open position; liner lock for quick one-handed operation; all metal body design for added durability; wire stripper for built-in convenience and (1) blade included. BladeLock technology keeps blade locked in place and further improves safety by providing the user with the ability to change blades only when the release button is engaged and the blade holder is in the 45 degree open position; liner lock for quick one-handed operation; all metal body design for added durability; wire stripper for built-in convenience and (3) blades included. Combines the best features of a lock back knife with a utility knife, sturdy aluminum handle, fold out blade housing. The blade is changed easily using snap lock and sliding mechanism. Uses standard utility blades. Combines the best features of a lock back knife with a utility knife, sturdy aluminum handle, fold out blade housing. The blade is changed easily using snap lock and sliding mechanism. Uses standard utility blades. Combines the best features of a lockback knife with a utility knife with a sturdy aluminum handle and fold out blade housing. The blade is changed easily using snap lock and sliding mechanism. Uses standard utility blades. BladeLock technology keeps blade locked in place and further improves safety by providing the user with the ability to change blades only when the release button is engaged and the blade holder is in the 45 degree open position; liner lock for quick one-handed operation; fold-out screw driver and additional bit storage fits 1" insert bits for quick fixes and provides additional tool versatility; blade storage that holds up to 2 additional blades; all metal body design for added durability; wire stripper for built-in convenience; (3) blades, #2 Phillips and #2 Square insert bits included. Secure lockback design and one hand opening operation that folds to convenient carrying size and a a quick change blade mechanism and uses standard utility knife blades. Stainless steel and polished hardwood handle with belt clip. Includes: (1) one blade. Camouflage lightweight ABS handle with pocket clip, quick change mechanism, back lock and thumb rest. One hand opening operation. Includes: (5) five extra blades in handle. Convenient belt clip, folding lockback utility knife holds 5 blades in handle compartment. Blade changing is easy with no tool required. Heavy duty construction for contractor use. Folds to convenient carrying size. Includes: (5) five blades.